ARM delivered a strong financial performance, achieving record headline earnings of R4.1 billion (F2013: R3.7 billion) and paid an increased dividend of 600 cents per share (F2013: 510 cents per share). * Includes IFRS 11 adjustments. ARM Platinum headline earnings increased by 68%. A combination of improved sales volumes, a weaker Rand versus the US Dollar and a strong operational performance saw the Nkomati and Two Rivers mines increase headline earnings by 91% and 88% respectively. Modikwa Mine experienced a challenging year with lower production volumes and contributed R64 million to headline earnings (F2013: R96 million). ARM Ferrous headline earnings of R3.74 billion were positively impacted by a 17% weakening of the Rand against the US Dollar. The positive impact of higher Rand prices was however partially offset by lower iron ore and manganese ore sales volumes. ARM Copper reported a headline loss of R309 million as the Lubambe Mine continued its ramp-up to full production. Commissioning challenges in the vertical shaft have delayed ramp-up. These challenges have been addressed and the mine is now targeting full production in F2016. ARM Coal reported a headline loss of R120 million due to lower export prices and operational challenges at the Participating Coal Business (PCB). Our ability to maintain a competitive cost position for each of the operations remains entrenched in our strategy. All divisions are encouraged and incentivised to pursue cost reduction initiatives to mitigate above-inflation cost increases. On 21 May 2014, Nkomati Mine completed 365 consecutive days without a lost-time injury. Regretfully, despite our ongoing efforts to ensure that the highest safety standards are maintained at all our operations, a surveyor was fatally injured at Modikwa Mine in June 2014. I would like to echo the Board and management’s sincerest condolences for this unfortunate loss of life. ARM Ferrous exported 13.6 million tonnes of iron ore in F2014, which was 3% lower than last year. The reduced volumes were largely due to interrupted water supply at the Khumani Mine. Local iron ore sales from the Beeshoek Mine remained constant at 2million tonnes. Manganese ore sales volumes decreased 5% to 2.7 million tonnes, largely as a result of reduced local sales. The manganese ore rail export channel to Port Elizabeth continued to operate under difficult conditions and we had to export manganese ore via Durban, using a combination of rail and road transport. Assmang and Transnet continue to engage on export capacity and growth for both iron ore and manganese ore. Transnet has now concluded its feasibility study to expand the manganese ore export capacity to 12 million tonnes per annum through the Port of Ngqura (Coega) by February 2019 and 16 million tonnes per annum by October 2020. Manganese alloy sales volumes were 279 000 tonnes as the smelters continued producing at below capacity due to weak market conditions. Together with Assore, ARM is reviewing the strategy for the smelters and has implemented a number of cost saving changes as a cash preservation measure. Chrome ore sales volumes decreased by 6% to 988 000 tonnes. Even though sales volumes were lower, unit cost of sales increases for the iron ore division were marginally above inflation. Khumani Mine’s production unit costs increased 10.6% driven by higher than inflation wage increases and maintenance costs consistent with an ageing fleet. Beeshoek Mine’s unit production cost increases were in line with inflation. Unit production cost increases at the manganese ore operations were higher than inflation, which was mainly due to above inflation wage increases and greater tramming distances between shaft infrastructure and underground work areas. Ore handling infrastructure is being upgraded to reduce trucking distances and improve productivity. Manganese alloys unit production costs at Cato Ridge Works increased by 1% and the Machadodorp Works unit production costs increased by 55%, due to lower production volumes as a result of low demand. Unit production costs decreased by 2% for chrome ore due to benefits realised from an operational efficiency programme. Unit costs at the Chrome Metal Recovery Plant decreased by 7%. ARM Platinum’s PGM production (on 100% basis including Nkomati) increased to 841 581 6E ounces from 786 254 6E ounces. Two Rivers PGM production increased by 7% driven by higher tonnes milled and improved plant recoveries and efficiencies. In addition, Two Rivers increased its UG2 Run of Mine stockpile to a total of 437 960 tonnes of ore (F2013: 305 328 tonnes). Modikwa’s PGM production, however, declined 13% hampered by a cessation of mining at the Hill shaft, a one week industrial action stoppage during March 2014, safety stoppages and a fatality in June 2014. Increased waste dilution due to geological features and the processing of lower grade Merensky ore purchased from Two Rivers, resulted in a 5% decline in the Modikwa plant feed grade. Nkomati’s nickel production decreased by 1% to 22 874 tonnes from 23 220 tonnes. Nkomati’s chrome concentrate sales increased 52% to 341 809 tonnes (F2013: 224 754 tonnes) and Two Rivers commenced chrome concentrate sales in October 2013, with a total of 160 951 tonnes sold in F2014. Consistent with the strong operational performances ARM Platinum achieved good cost control. Nkomati’s unit cash cost increased by 5% to R308 per tonne (F2013: R292 per tonne) while the C1 unit cash cost net of by-products, reduced by 3% to US$4.81/lb (F2013: US$4.98/lb) of nickel produced. Two Rivers managed to maintain unit cash costs at R5 266 per 6E PGM ounce (F2013: R5 244 per 6E PGM ounce). Modikwa’s unit cash cost increased by 20% to R7 545 per 6E PGM ounce (F2013: R6 275 per 6E PGM ounce) due to the 13% decrease in production at the mine. Run of Mine (ROM) and saleable production at the GGV Mine were 2% and 11% lower respectively. This was mainly due to a mining excavator that was damaged by a fire and was subsequently out of operation for two months, an increase in the mine strip ratio and the impact of an industrial action stoppage. An improvement in rail performance resulted in a 16% increase in GGV export sales volumes, but Eskom curtailed buying of additional coal, resulting in a reduction of 30% in Eskom sales volumes. GGV on-mine saleable unit costs increased 22%. On-mine saleable unit costs in F2013 benefitted from significant in-pit and ROM inventory. The on-mine saleable unit cost in F2014, at R208 per tonne, represents more normalised levels. PCB was negatively affected by a 9% decrease in export sales volumes and a 22% decrease in export coal prices. Lower export prices were as a result of an overall decline in market prices together with lower quality coal being supplied in response to changes in market demand dynamics. Eskom and domestic sales volumes increased 15% and 53% respectively. PCB saleable production volumes were 5% lower following a strategic decision to downsize high-cost underground sections and shut down a high-cost Coal Handling Processing Plant (CHPP). In addition, the average yield reduced by 7% due to a change in the mix of the qualities of the coal being fed into the plant. The decrease in saleable production impacted on-mine unit production costs which increased by 21% to R396 per tonne. A two million tonne coal stockpile, to be used for the commissioning of the CHPP, is expected to benefit unit costs next year. The transformation from underground mining to opencast mining is on schedule and is expected to result in an improvement in saleable production and unit costs. The Lubambe Copper Mine in Zambia is continuing its ramp-up to full production to produce 45 000 tonnes of copper in concentrate by F2016. Although the main vertical shaft was commissioned in November 2013, throughput constraints were experienced in the refurbished shaft’s rock pass systems, as well as through the main tips at the East Decline. These have since been corrected. By 30 June 2014, 1 558 390 tonnes of copper bearing ore had been milled and yielded 23 791 tonnes of copper. Copper recovery from the concentrator plant improved averaging 77.6% for the year. Concentrate quality issues have been resolved and new off-take agreements are in place to treat the full production from Lubambe at Konkola Copper Mines and Chambishi Copper Smelter, both situated in Zambia. Mechanised access development is progressing well with ore drive development on schedule. Poor ground conditions are still being experienced in certain places and have delayed one of the main transfer tips in the East Limb. The stoping dilution is a concern and the mining layouts are being modified to improve the milling head grade. Operational efficiency and equipment utilisation are receiving the required level of attention to improve output and reduce unit costs. All other project capital work regarding outstanding underground and surface infrastructure work was completed on schedule and within budget. 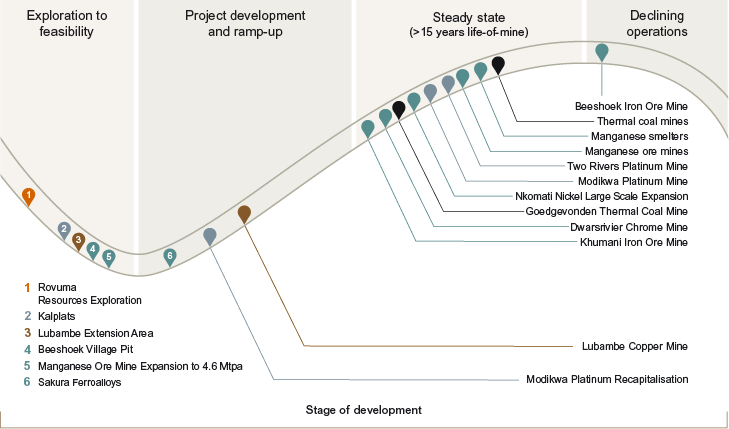 ARM actively pursues new mineral opportunities in Africa based on commodities within ARM’s current portfolio. The agreement with Rovuma Resources Limited, a Mozambican exploration company, is ongoing. Rovuma explores in northern Mozambique and has identified numerous occurrences of copper/zinc, nickel/copper/PGE, chromite/nickel and graphite mineralisation. ARM has agreed to continue with the option for the fourth year and to fund exploration at a cost of about US$7million for the year commencing 1 April 2014. ARM will have exclusive rights to exercise options to purchase prospecting and/or mining rights to the resources. ARM’s various projects ensure the medium-term delivery of improved volumes, improved operating efficiencies and additional cost savings. These projects supplement our existing growth pipeline and form the nucleus of our future growth. ARM has built a significant source of knowledge through numerous projects that have been successfully commissioned over the years and also by sharing internal best practices amongst all our operations as well as developing innovative solutions across our businesses. The manganese alloy operations are under review mainly due to their cost position above the 50th percentile of the global cost curve. Focus in F2015 will be on improving the contribution from PCB, Lubambe and Modikwa as well as ensuring that the iron ore and manganese ore operations maintain their competitive cost position, especially in light of the significant fall in US Dollar prices for these commodities. I am confident that we are operating with good momentum to deliver improved operational performances that will translate into additional value enhancement. In most instances, our cost performance remains satisfactory, while planned and ongoing cost saving initiatives will allow us to continue to move our businesses progressively down their respective industry cost curves. I once again sincerely thank all employees for their enthusiasm and hard work, as well as our Executive Chairman and the Board for their leadership, understanding and support. We are committed to steering the Company through these challenging times and remain focused on securing and sustaining our exciting future.